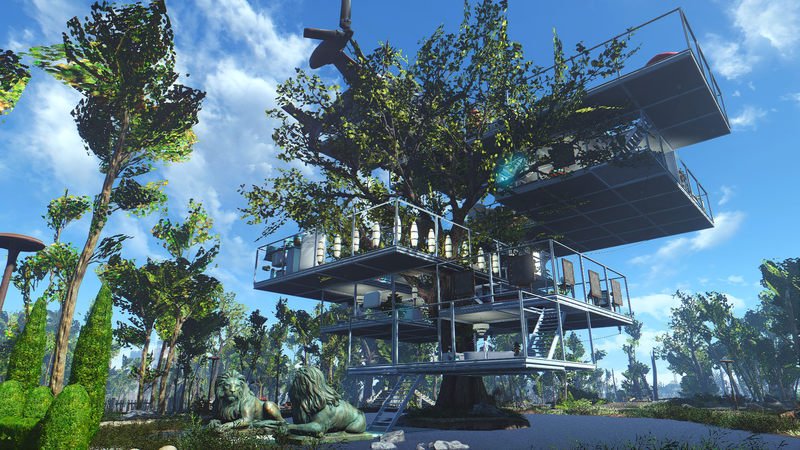 *All the following photos are taken in the same location/lighting using a modified version of the Poupouri Morning Star ENB (less saturated, more sub-surface scattering). All the face settings for the character are exactly the same in each photo. 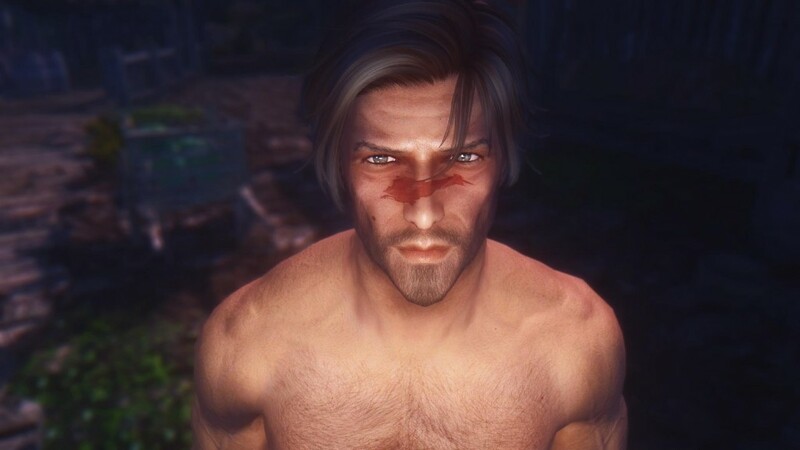 Damn, what is it about the vanilla male face texture that makes your character look 500 years old?! Seriously, he looks like a zombie or a guy who hasn’t slept in decades. I think the vanilla texture is just too weathered for my liking. 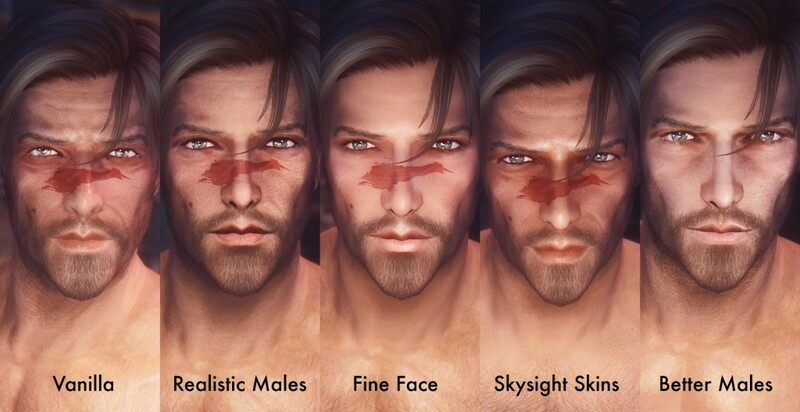 This mod is my absolute favorite for male face textures. There are 3 different flavors – Younger Faces, Geonox, and a mix between the two. 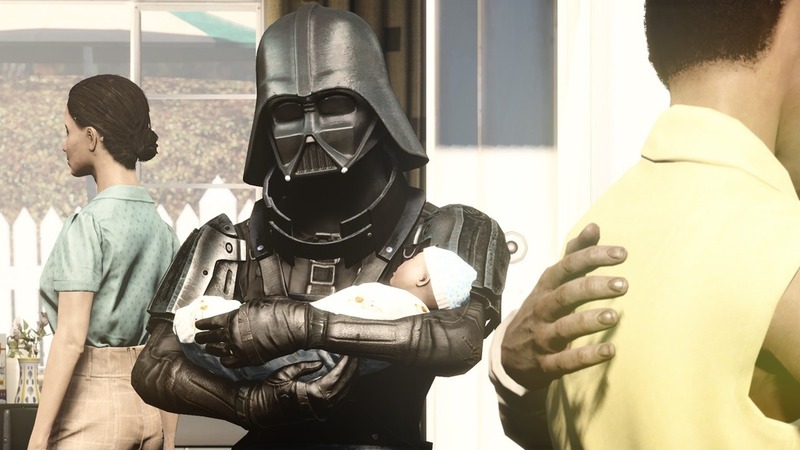 My personal preference is for the mixed version – I think it does a good job making your character appear fresh faced but not smooth as a baby. 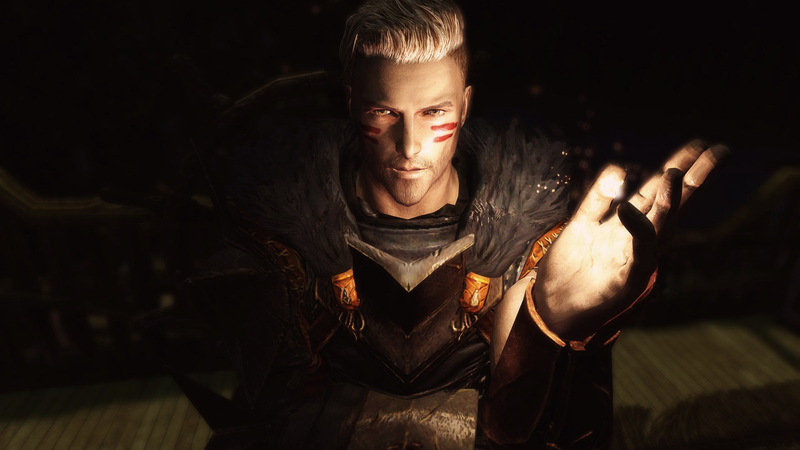 The Younger Faces version is just way too flawless and porcelain-like for me. The Geonox version is better but I don’t love the eye bags it gives my character. This mod comes in 2 flavors, rugged and smooth. I prefer the rugged one over the smooth one – it looks much more realistic. 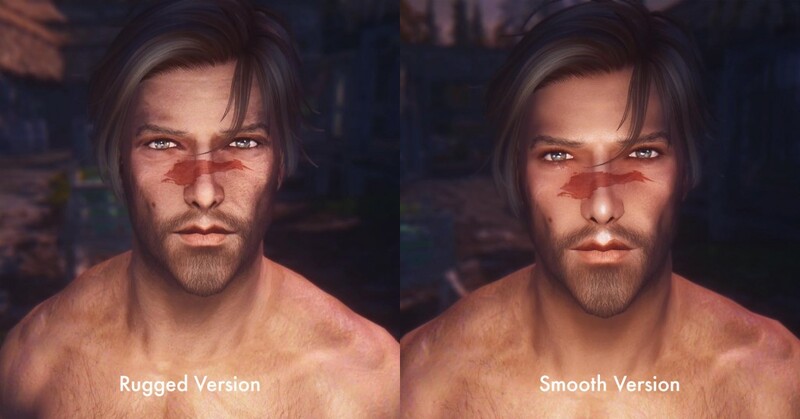 The smooth version is too flawless, making your character look like a plastic Ken doll. That being said, neither of these settings achieves the look that I like. This is like a super HD version of the vanilla skin, so if you like how weathered the vanilla texture is, you’ll like this mod. For me, it’s just too haggard looking, but the textures themselves are nicely done. If you’re building an older character, this might work well for you. 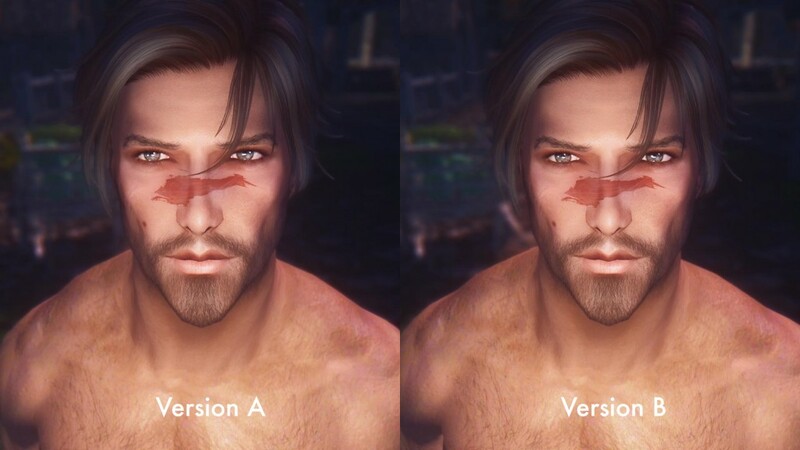 There are two versions of this mod, A and B, but both look almost identical IMO. Both give your character a super young baby face. With my ENB, there is a reflective sheen and the texture looks too plastic-y (but it may not be the same if you’re not using an ENB). 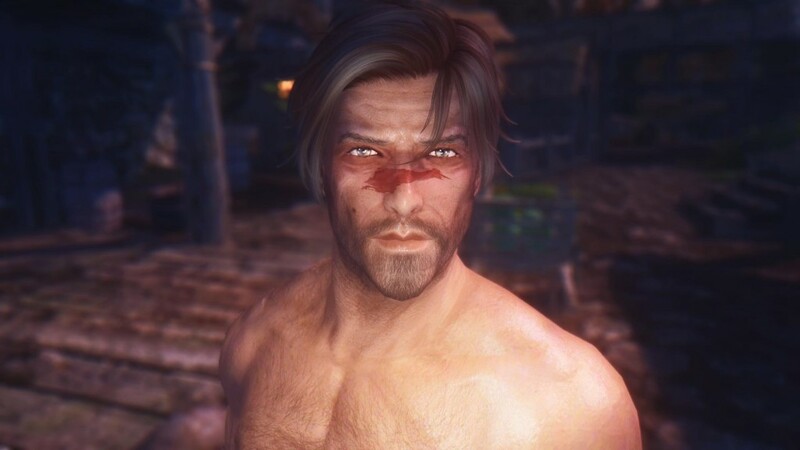 For some reason, it also makes it look like your character is wearing guyliner so unless you want an emo OC, I wouldn’t recommend it. Hope you find these comparisons helpful – don’t forget to check out my female face texture comparison here. Which one is your favorite face texture? Let me know in comments! What type of face paint is that? Can you please post the link?